From time immemorial, India has been the land of sages and seers who practiced austerity and ascetic and meditated for several years. It is believed that whenever the cup of evil brimmed on the earth, a divine intervention is felt that not only conquer the dark forces but also bring consciousness; help in creating a the lamp of peace, devotion and wisdom that has in return helped in the overall development of human. When it comes to the land of Lord Badri and Kedar, Uttarakhand, lauding for which even millions of times is just not enough. It is mentioned in our religious scriptures that this Himlayan state has been the earthly abode of Gods. It is said in every part of Uttarakhand the entity of the divine, the Supreme can be felt. This holy land was the meditation centre for Lord Shiva. Also, Ved Vyas chose Uttarakhand to be the place to compose many of his eminent works. The state has also been blessed as the progenitor of sacred rivers like Yamuna and Ganga. In this land of Badri and Kedar, several orators have been enlisted, amongst which the name of Acharya Vipin Krishna Kandpal is well known. 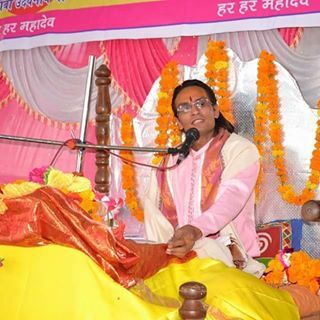 The orator of Shrimadbhagwat Mahapurana, Sri Shiv Mahapurana and Devi Bhagwat Mahapurana, Acharya Vipin Krishna Kandpal was born to Pandit Umashankar Shastri and Shashi Devi in 1985 in the village of Dashjyula Patti, Bainji Kandai in the Rudraprayag district of Garhwal region in Uttarakhand. Acharya Ji received his primary education in the school located in the native village. 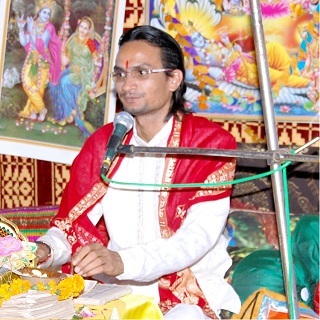 After graduating high school with excellent grades, Acharya felt a strong inclination towards Ved-Puranas, thus he decided to further learn about these religious scriptures. Under the excellent guidance of Jagadguru Jyotishpeetha Shankarcharya Sri Madhavananda Ji Maharaj, Acharaya Kandpal studied Sanskrit, Astrology, Karmakanda and Purana in his school at Ludhiana Punjab. Thereafter, Acharaya Ji obtained his post graduate degree in Sanskrit grammar from Shardadevi Sanskrit Vidyapeetha (Recognized by Sampoornanda Sanskrit University) in Delhi. By being born in the Brahmin family and inherited moral values, Ved-Puranas always beckoned Acharya Kandpal Ji. From his early age, he began to study the Shrimadbhagwat Mahapurana, Sri Shiv Mahapurana and Devi Bhagwat Mahapurana under the guidance of his uncle Sri Bachchiram Kandpal Ji who himself was an eminent orator. At the ripe age of 18 years, Acharya Kandpal Ji built a strong grip as an effective orator and since then he has been to 150 small and big cities of India for elocutions of Bhagwat. The sole and prime motive of Acharya Kandpal Ji is to offer the vedic and ancient teachings of the Hindu religion. Along with it, he likes to inspire people to eradicate the unlawful practices in the society. In his speeches, Acharya Ji has from time to time discussed vital social issues like ‘Beti Bachao Beti Padhao’, ‘Jalsanchay Jal Sarvadhan’, ‘Gau Sewa’, ‘Environment Conservation’, ‘Serving Parents’and ‘Attending to the needs of Poor’. Acharya Ji is of the thought that in order to make our coming generation free from corruption, rapes, fears, diseases and other evil practices then we all need to return to our Vedas, Puranas and Upanishads. If you wish to invite Acharya Kandpal Ji for the recital of Shrimadbhagwat Mahapurana, Sri Shiv Mahapurana and Devi Bhagwat Mahapurana and performance of Yagya for some noble cause, kindly contact on the given numbers. 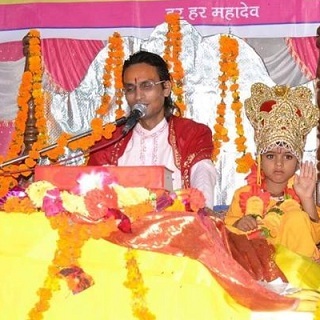 Acharya Vipin Krishna Kandpal Ji Maharaj- Shrimad Bhagwat Katha Vachak, Shiv Mahapuran Katha Vachak & Shrimad Dev Bhagwat Mahapuran Katha Vachak from Badrinath-Kedarnath. © 2016 Acharyavipinkrishna. All Rights Reserved. Site design and develop By Acute IT Solutions (P) LTD.